Leading a dairy free lifestyle is sometimes trickier than it seems, I mean it's pretty easy to spot 'milk' as an allergy on most ingredients lists/menus but sometimes I get complacent and things I ASSUME would be dairy free, often lead me into the most trouble! This past weekend I have been working away in London. This generally means eating food from a standard pub style eatery and I'm pretty good at navigating a menu; steak and chips = GOOD, pasta carbonara = BAD. But the first night of my stay I had a hotdog which was free from dairy, and it was delicious! On the 3rd night, I decided to finish off my stay with the same yummy meal only to end up in agony hours later. The onions were cooked on the 2nd meal (thay were chopped up raw 1st time around) so I can only assume they were fried in some butter or margerine. 2 days after that meal I'm still nursing a very sensitive digestive system but after spending 3 days at a cake show, all I can dream of is sugar! This weekend is officially the start of chocolate fest i.e. Easter, so I decided to whip up a chocolatey treat that I'd be safe to indulge in to my hearts content. 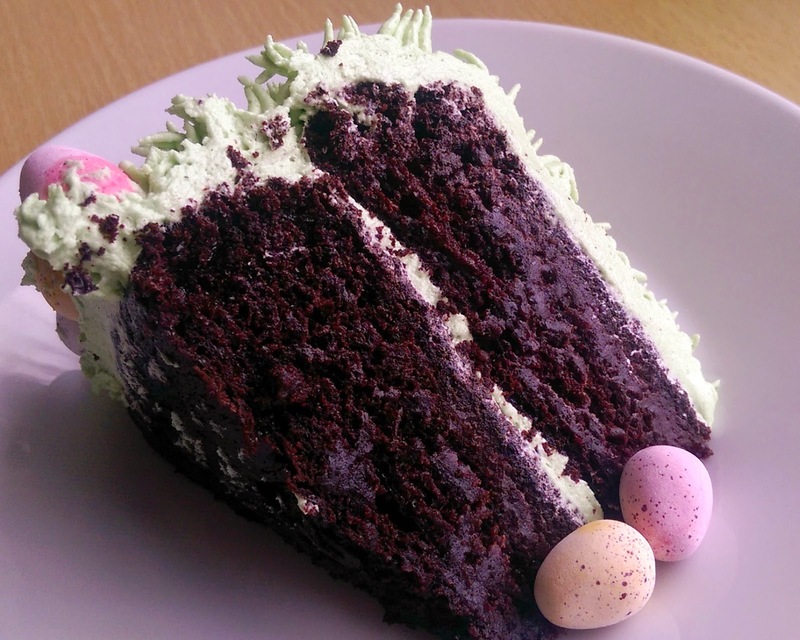 This chocolate cake is my go to cake recipe, it's based on a classic American chocolate cake which is lighter and more delicate that your classic chocolate sponge cake. The only changes I made to this recipe were to substitute the dairy ingredients using Vitalite http://www.dairycrest.co.uk/our-brands/butter-spreads/vitalite.aspxand Almond Milk, so if you're not dairy intolerant then use the same amounts but with butter/milk instead. This does make for a slightly denser and more fudge like cake, but I loved this changed texture as it was a cross between a pudding and a cake. The frosting is HEAVENLY. Really creamy and light and perfect for use on cakes and cupcakes alike. I have been trying to create a perfect buttercream style frosting using Vitalite and this is it. Some people might be concerned about using Trex in place of butter but trust me on this - it's sooo worth it. Add eggs, milk, oil and vanilla and mix for 2mins. I make this cake the old fashioned way using a bowl and wooden spoon! Slowly stir in boiling water. Don't panic, the batter will be VERY thin - and that's OK! Pour into tins and bake for approx 30-40mins or until a toothpick inserted in the centre of the cakes comes out clean. Cool on racks until completely cold and decorate straight away. Cream together vitalite and trex until light and fluffy. Add vanilla extract and then slowly add the icing sugar until all incorporated. 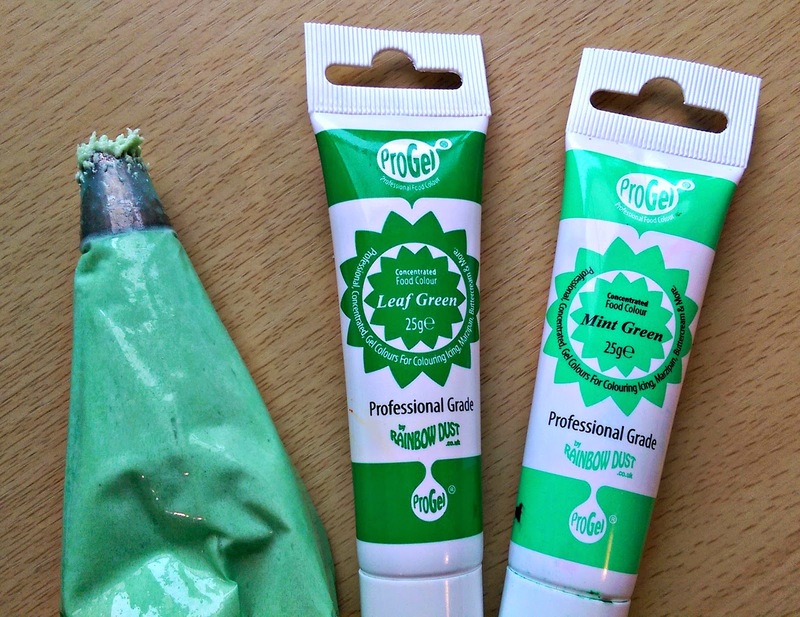 Beat on high for up to 5mins to create an extra creamy frosting! 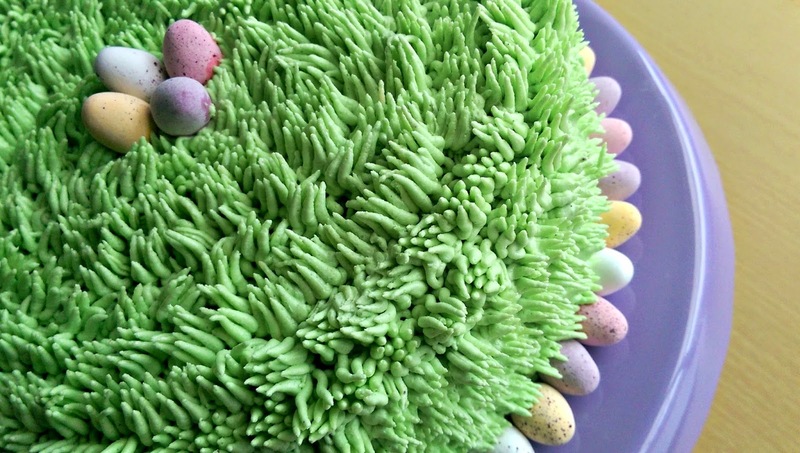 I used a disposable piping bag and Wilton 233 grass nozzle to create the grass effect on my cake. I coloured the frosting with a tiny bit of Mint Green and Leaf Green Progel colour and piped directly onto the cold cake. 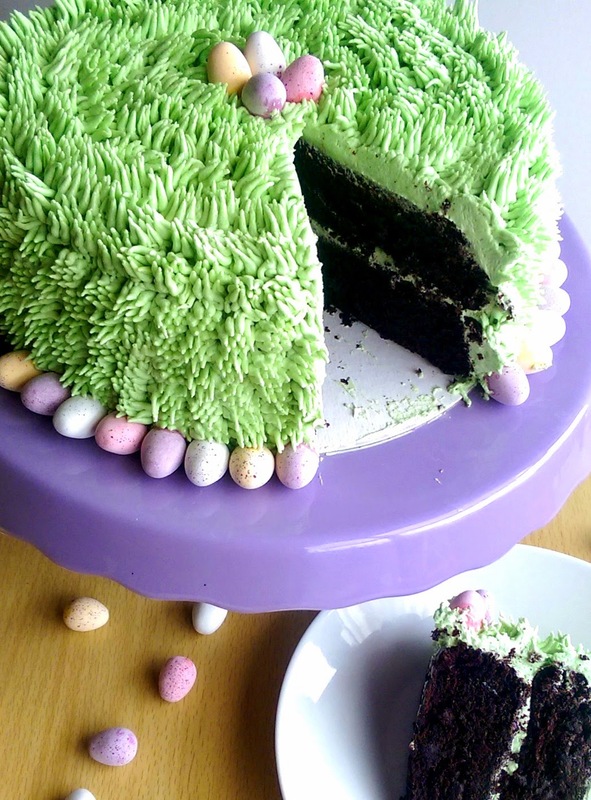 The mini eggs were added prior to cutting as they can absorb grease from the frosting and you don't want to ruin your pretty cake! 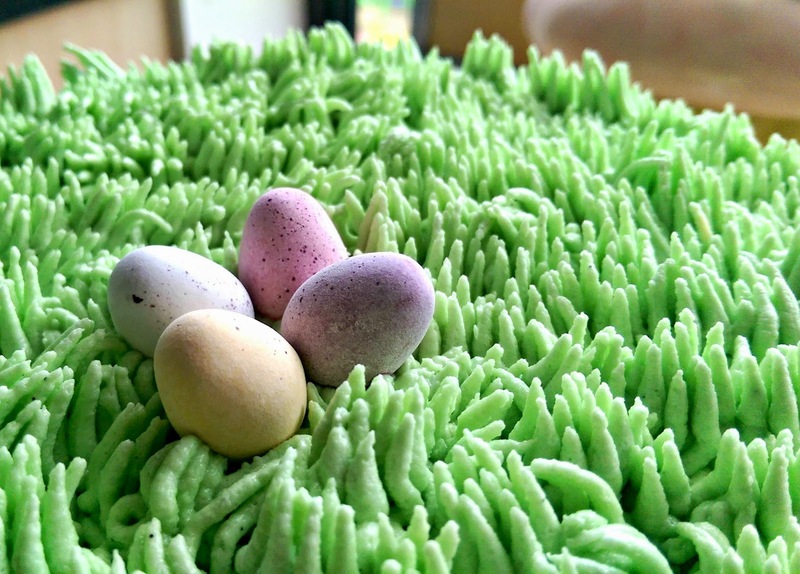 Oh and of course I didn't eat these, I removed them after cutting but they were completely necessary for an Easter themed cake!